It is considered as a medical emergency and is more commonly called septic arthritis or bacterial arthritis. It happens when a particular kind of infection attacks the joint tissues. The situation is accompanied by a frequent discharge of pus. As time progresses, the extent of infection also worsens. Therefore, immediate treatment should be provided .More susceptibility is seen in the artificial joints rather than natural ones. Septic arthritis is seen more profoundly in a single large part of the body. However in certain cases, it can affect multiple joints simultaneously. Spreading of bacteria from one portion of the body to another. Bacterial infection arising from an open wound. Bacterial infection arising from an opening of a surgery such as a knee surgery. Children are also affected by this disorder. The bacteria types that can cause such an infection are staphylococcus, Haemophilus influenze, streptococcus etc. Other than bacteria, various fungi and viruses can also lead to this condition. The fungi include coccidiomyces, blastomyces, histoplasma etc. Viruses that can cause this disorder include herpes virus, hepatitis A, B and C, HIV virus, mumps etc. The most common symptom of septic arthritis is the sudden onset of intense pain accompanying with fever and swelling. However, other symptoms may also be present. They include general weakness and fatigue, decreased joint mobility, warm sensation felt over the joints etc. Infectious arthritis is generally diagnosed with the help of a procedure called arthrocentesis. 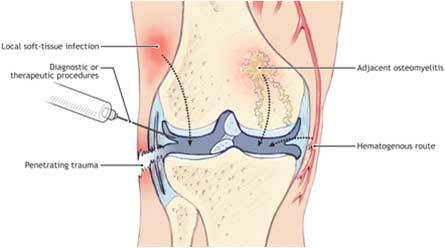 In this procedure, a needle is injected into the respective joint and the synovial fluid is taken out. The fluid is then tested for any bacterial, fungal or viral presence. However, common inflammation monitoring methods like blood test, MRI, X-rays etc can also be performed. Scope method: In this method, a small incision is made and through this incision, a tube and camera is inserted. After this, two main tubes i.e. drainage and suction tubes are inserted into the joints for the fluid removal. Open surgery: This method is only resorted when the scope method becomes very difficult for the particular joint. Needle: This is a relatively simple method wherein the fluid is removed with the help of a suitable needle inserted into the specific joint. The other method is the usual use of medicines. For those cases where surgical procedures are contraindicated, long term use of antibiotics is administered .The medications are usually antibiotics. The procedure of giving the antibiotics is mostly done intravenously. After suitable amounts are injected, one can switch to the intake of oral antibiotics. Antibiotics are chosen after considering the various side effects like diarrhea, vomiting, nausea etc. It is to be noted that the treatment methods are time consuming.